Beginning with his Rookie of the Year campaign in 1960, Oscar Robertson averaged a triple-double in the NBA through 1965. He was the league MVP in ’64 and won All-Star Game MVP honors in ’61, ’64 and '69. He made the All-Star squad in each of his first 12 NBA seasons and was First Team All-NBA his first ten years in the league. 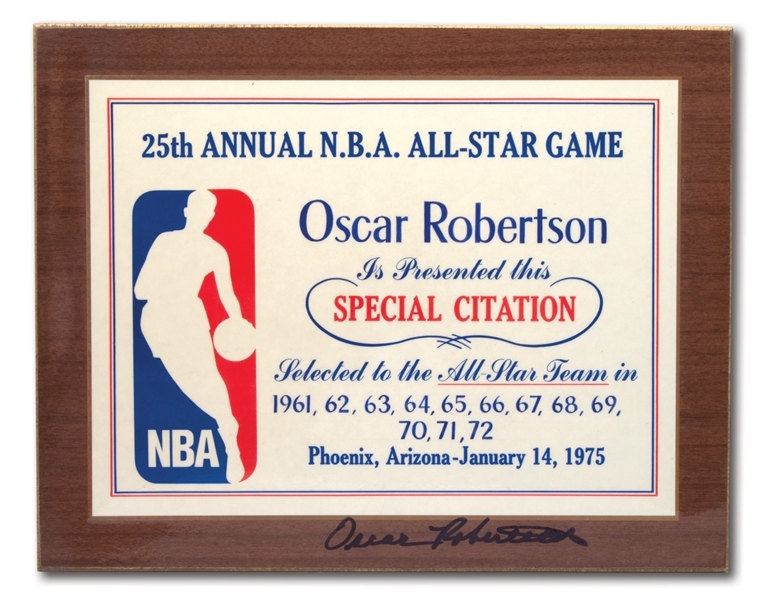 This lot features the Special Citation Certificate presented to "The Big O" at the 25th All-Star Game played in Phoenix, Arizona on January 14, 1975. It recognizes his 12 consecutive All-Star selections from 1961 through 1972. The certificate measures 9" by 12" and is laminated on a 11" by 14" plywood backing. The eye-catching red, white and blue patriotic award remains in wonderful condition and has been autographed by Oscar at the bottom in perfect 10/10 black marker. Includes LOA from Oscar Robertson.